This is a great aftershave. My Husband really likes it it’s one of his favourite aftershaves, it’s a great smell. 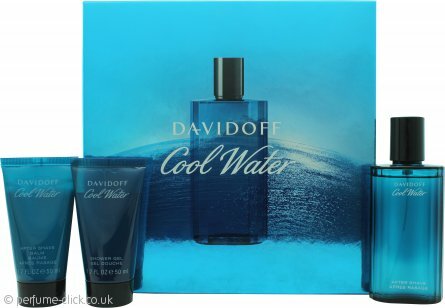 Davidoff Cool Water Woman Gift Set 30ml EDT + 50ml Body Lotion + 50ml Shower GelMy husband now me. I purchased Davidoff Cool Water for my husband and enjoyed the fragrance so much I decided to get the Women equivalent. I thought at first it may be a bit too sweet for me when I first smelt it, but using it was proved incorrect, it is wonderful, with aromatic fruity and aqua notes. Love this, love this fragrance its always been a favorite of mine. it is a gift for my grandson. Great value for money, can't wait to see his face on Christmas day. What a beautiful scent! Every time I spray it, i can't stop sniffing it!One of the best fresh, aquatic fragrance.. Created in the 80 's ( 1988) when the market was full of strong, masculine fougere frags...a very bold move.. It did open the market for the fresh, aquatic frags(armani acqua di gio, etc).It makes you feel fresh, clean and attractive.. A COMPLIMENT GETTER.